YOUR NEW VINYL PATIO DOOR WITH BROCK! Brock Doors & Windows Ltd. YOUR NEW VINYL PATIO DOOR WITH BROCK! If you are in the market for a new or replacement patio door here in the Toronto and the surrounding areas, consider visiting our team here at Brock Doors and Windows. Our team knows patio doors. These days, it seems like vinyl is used in all home products, including the patio door. There are good reasons for this—vinyl patio doors are durable, luxurious, and because they are plastic-based, they are easily designed to mimic more expensive and chic patio door materials. Like we mentioned, vinyl can be designed to mimic hardier, more sought-out materials like various woods. In fact, we can match the colour and texture of real wood! This does not mean Vinyl patio doors are both inexpensive and cost effective—that’s a double-benefit in one! Not only will you find more affordable options among vinyl patio doors by comparison with other patio door materials, but vinyl itself is highly energy efficient (which saves you money on your utility bill)! Vinyl will not peel, flake, corrode, or rot. We live in Toronto—we face intense winters. Patio doors made of mostly organic material (wood) can become damaged more easily from the elements. Don’t you want your patio door to stand up to snow, wind, hail, humidity, and extreme temperatures? Your patio door should be easy to maintain, or you will quickly regret your decision. Luckily, vinyl is known for being easy to clean and upholding its “new” look without the need for repainting or re-staining. A simple wipe-down with a damp cloth and it looks just as it did the day it was installed. We’ve all seen a faded wood door or two in our lifetime, and maybe some people enjoy that kind of character. Sure, there are chemicals out there that can bring a faded wood patio door back to life, but that tedious procedure will need to be done again and again. Vinyl, though, has no such issue with fading. In fact, it will continue to look brand new years and years after your Brock professional installs it. And… we all cheer! Warping is basically unfixable. That said, no one wants a poorly manufactured patio door that will warp over time from exposure to humidity and lack of maintenance. Vinyl does not absorb moisture—so, problem avoided! 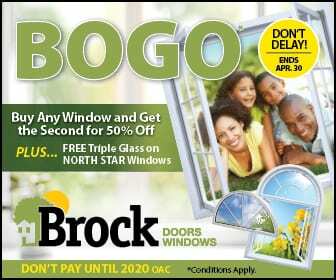 Come on over to Brock Doors and Windows and let our team help you find the perfect patio door in Toronto, Ontario. We know our vinyl options will WOW you! Are you working on a whole-home project? Give our team a call today and set up your free in-home consultation. Brock has all your door and windows needs covered!